Howz the week coming along?For me not soo good so far…I was expecting a slow week at work, turned out to be exactly the opposite. On positive note, I joined a pilates class in office clubhouse during the lunch hours, having a fun time stretching and moving and a very hot teacher to inspire us all!Only down side, after 1 hr intense stretches to each and every muscle on my body.I literally have to kick myself to keep my eyes open for rest of the office hours. Letz come back to today’s recipe, from my juicing marathon. I first had it from the ABC food court nearby my office.Apparently this is their best seller , I gave it a try once and no turning back. Totally in love with the juice, the colorful, power packed juice! Add everything in your blender, plus a ½ Cup water. Awesome colour. I better start workin out Ramya as the aches and pains I am getting are to much to bear and will use you as my roll model. working out at lunch. The only work out I do is eat and snooze. Your ABC juice is a great beginner juice recipe. It has a nice and sweet taste, and bright red color. It's also a perfect base for adding some green vegetables. Try out this Apple Carrot Juice Recipe, you might like it too. 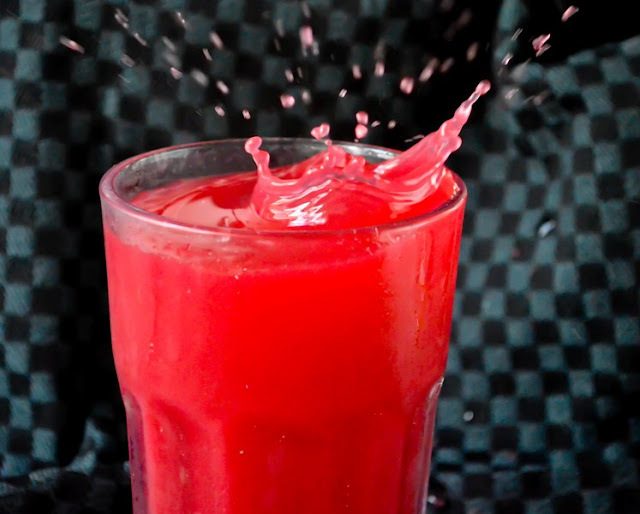 wow...love the way u captured the splash..perfect...love this juice..looks refreshing.